Tsuwabuki is naturally found in shaded areas and around the coast. 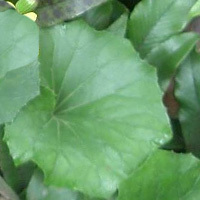 It is said to resemble the giant butterbur in shape. However, it actually comes from a different family of plants. It has a harsh taste if eaten without removing its astringent taste. Placing in water removes this harsh taste. It can be used in stews. The calories in Tsuwabuki per 2g(1slice) is 0 calories. Tsuwabuki is calculated to be 21Cal per 100 grams making 80Cal equivalent to 380.95g with 0.11g of mostly carbohydrates、0.01g of protein、0g of fat in 2g while being rich in vitamins and minerals such as Potassium and Vitamin K.